There is an old Inuit saying when carving, the artist was setting free the spirit of the animal within the stone or ivory. 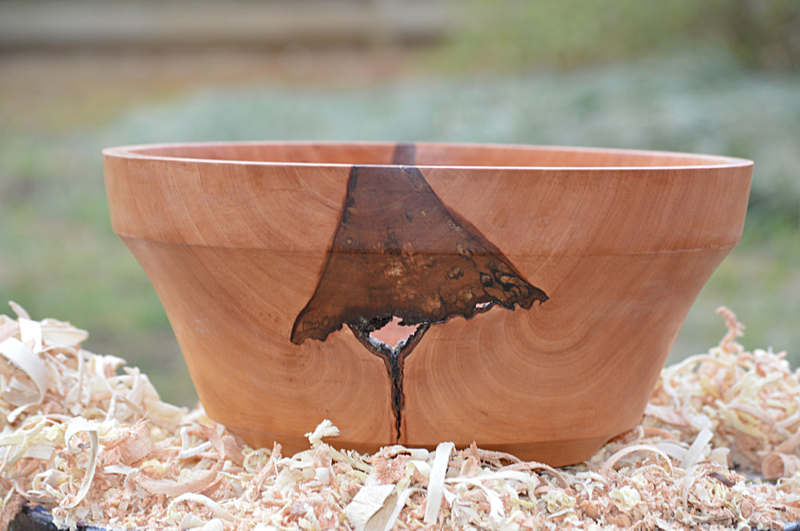 When turning a bowl, no matter what I have planned, it seems the piece of wood has it's own plans, or spirit. 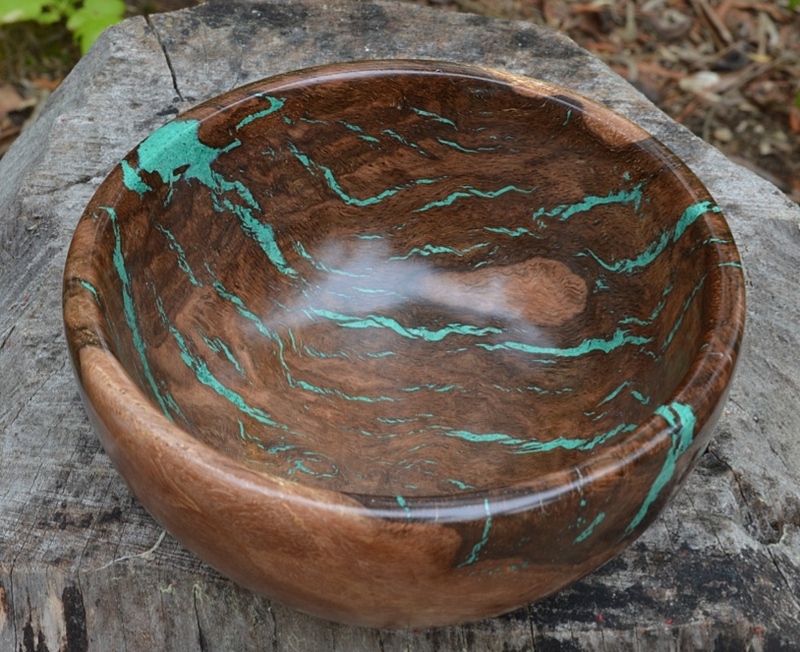 That is why each of my bowls are unique, each hand crafted on a lathe after careful selection of the wood, dried slowly under controlled conditions, carefully sanded, sealed with several applications of hand rubbed oil, and finally buffed after a thin coat of beeswax & walnut oil, or polished finished that has a little more gloss to it . 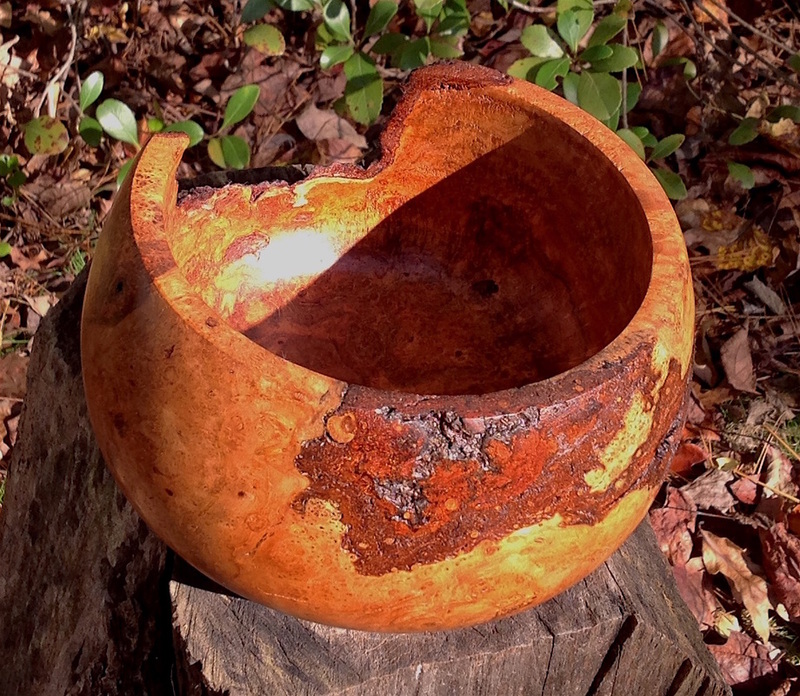 Burls are rare and sometimes purchased from local tree services and sell for higher prices. 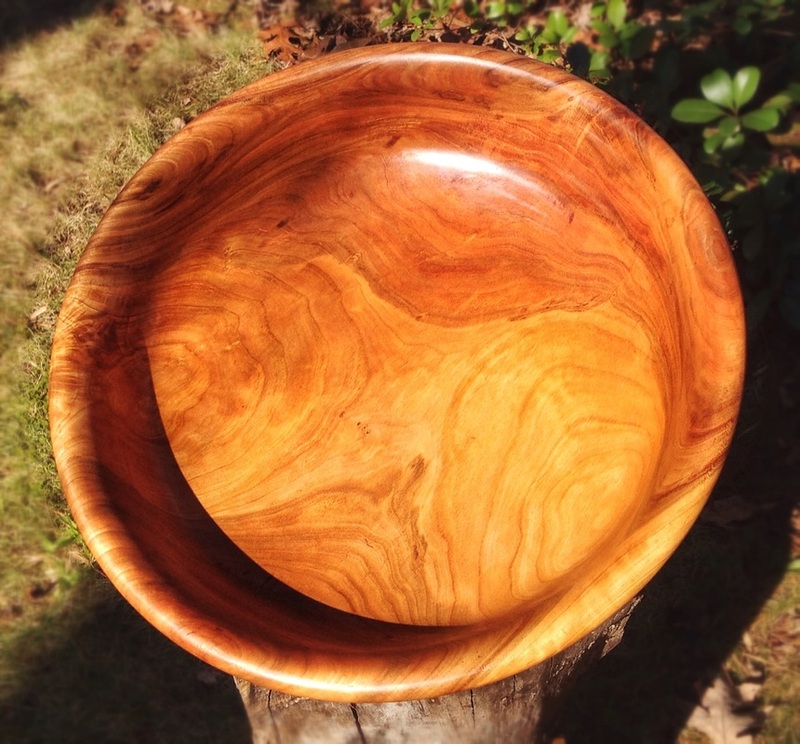 Natural edged, or bark edged and unusually shaped bowls take a lot of extra time to turn and sand. To keep things simple, shipping is included in the price. ​​I was just playing around with some wood and this came out and I think it’s rather nice. I took several pieces of some beautiful pine and glued them together to make a rectangular block. 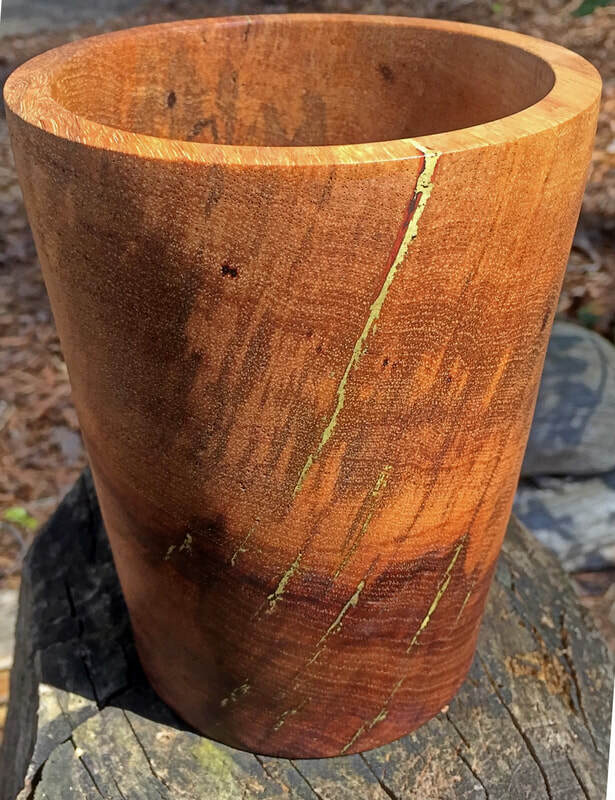 I then turned this vase from that block. I wish I had taken some pictures along the way to document the process. 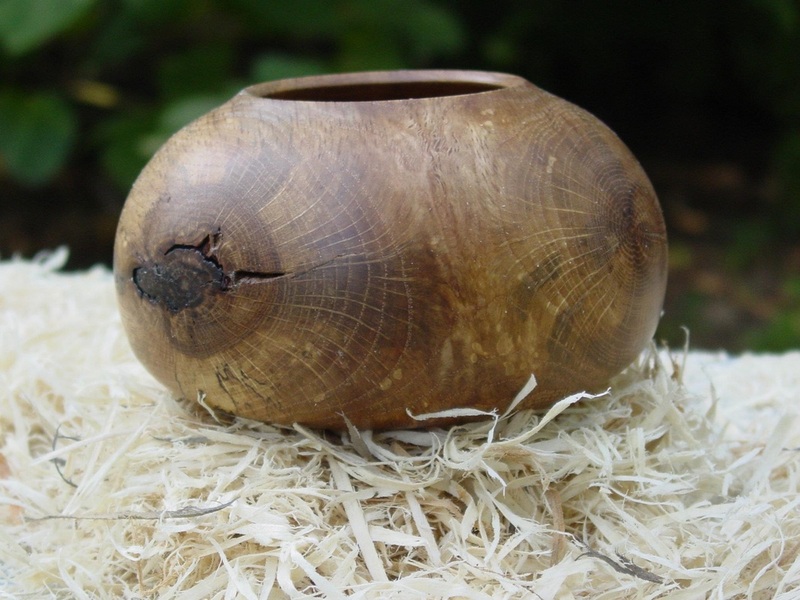 It stands about 8" high, 2" wide at the top, 4" wide at its widest point, then the base is 3 ¼“. 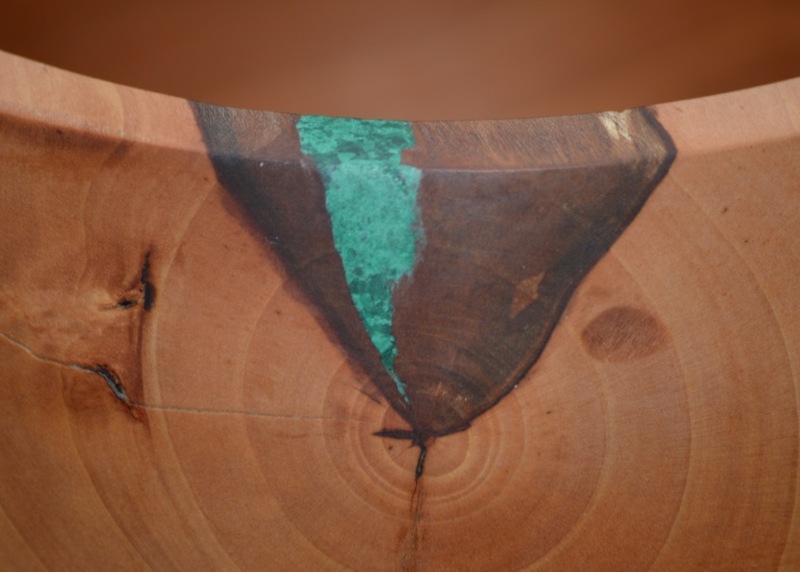 It has a satin water-based polyurethane finish that shows off the grain nicely as you can see from the pictures. 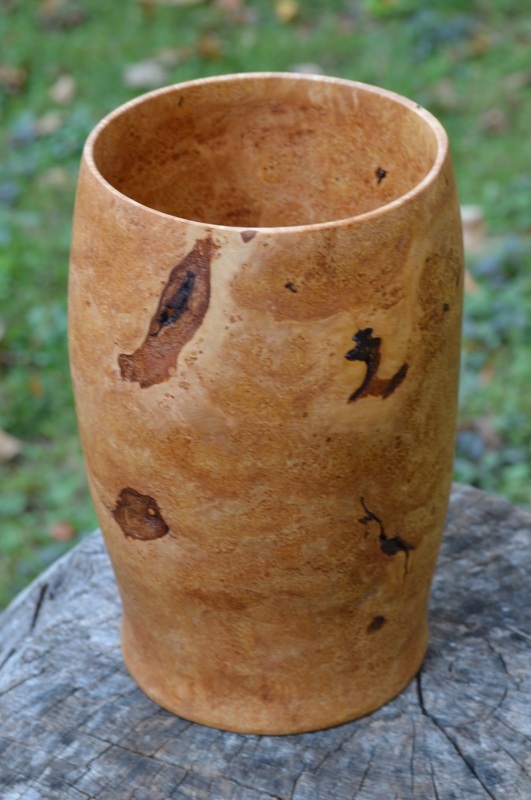 I think Cherry Burls are like gold when it comes to wood turning. Not the easiest thing to turn, as you are always worried about it flying apart with all the imperfections. (Yes, I wear protective gear) But the end results are worth it. I sealed the grain after sanding, then finished with a water-based polyurethane, trying to keep the lighter color of the wood. 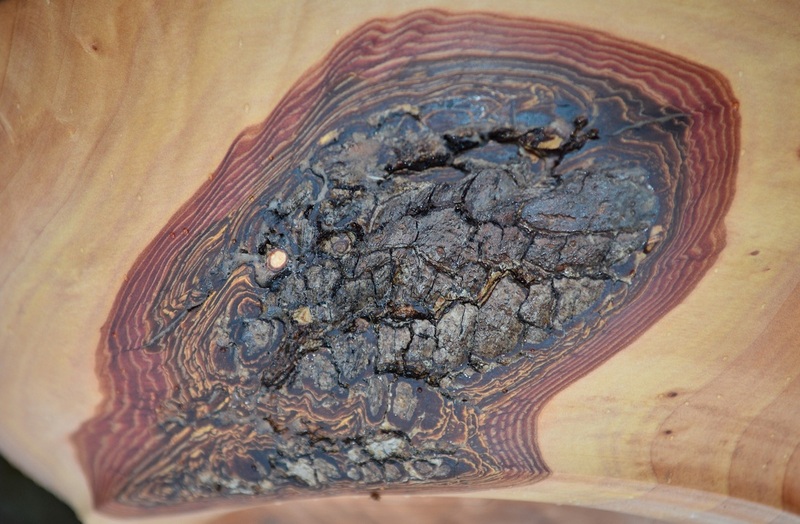 Cherry burls tend to go dark red when finished, this came out more pink then red. 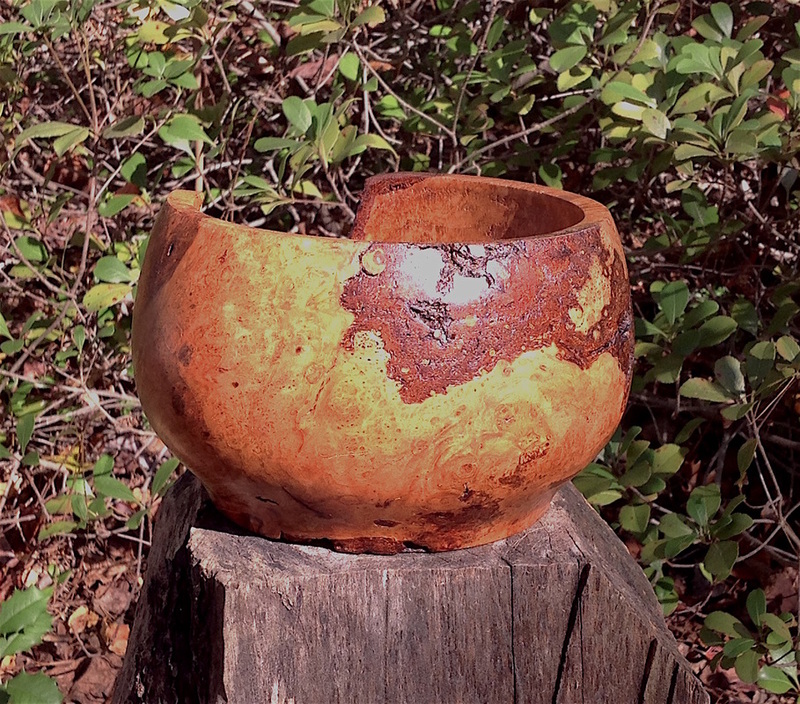 This piece stands about 2 5/8” high and just a little over 8 ½” in diameter. 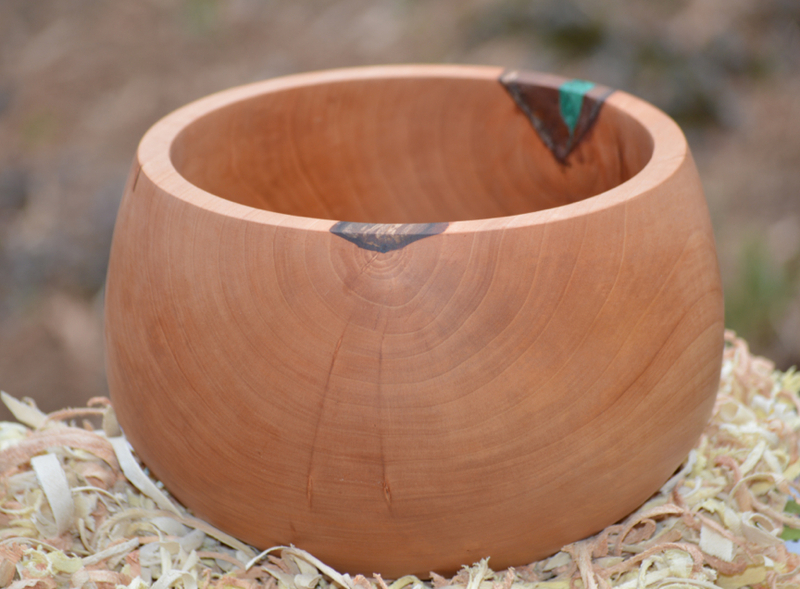 Mesquite's hardness and interlocking grain make it quite challenging to work with and I had to constantly sharpen my tools. 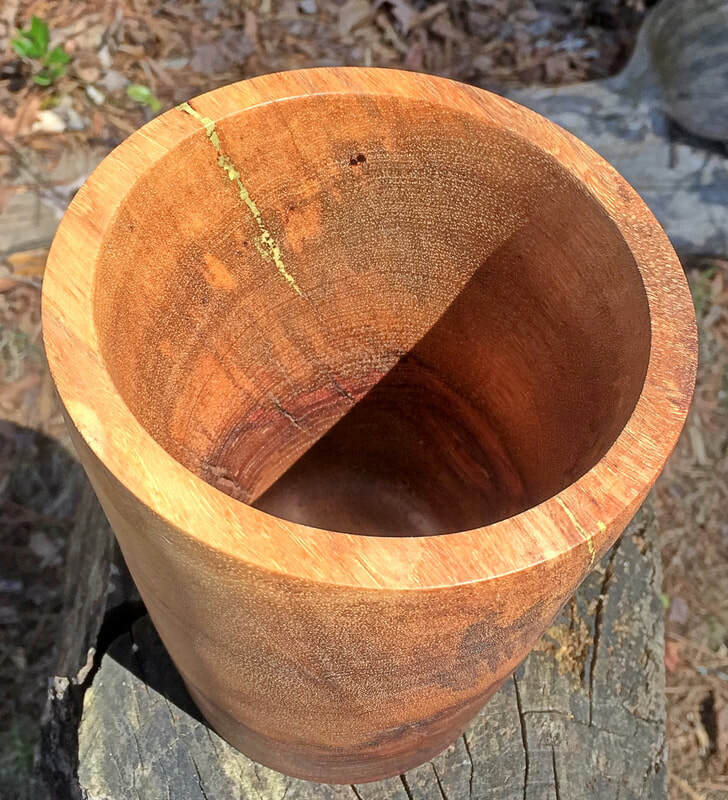 Also the darker heartwood is much more dense than the lighter sapwood which presented more challenges in balancing while spinning on the lathe and the vibrations produced. I added some brass inlay to some of the natural checking in this piece and was pleased with the results. 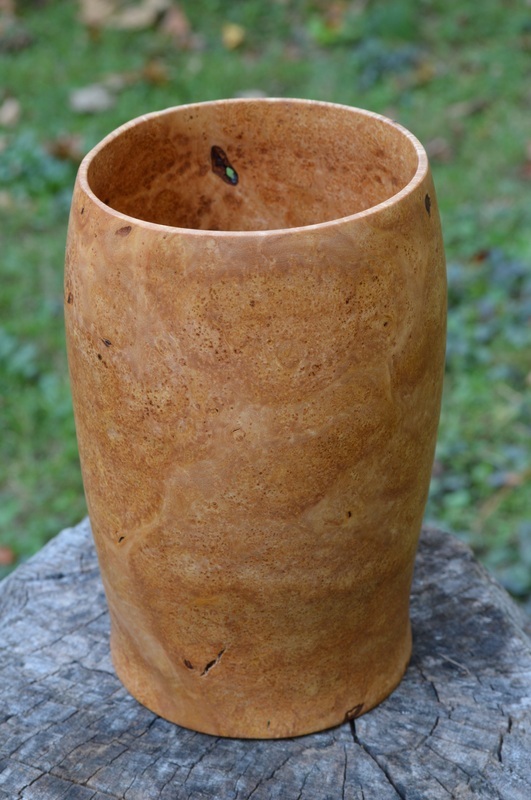 The vase stands about 6 ½ “ tall, the base diameter is 4” increasing to 5 1/8” diameter at the top. I also made a two drawer Band Saw Box out of Mesquite that you can see here. Or maybe a platter depending on what your description if a platter is. Anyway, this piece is a little over 12" wide and stands about 2" tall and sits on a base about 6" wide. It has a satin finish that shows off an interesting grain including a small knot. Cherry has quickly become one of my favorite woods to work with, it turns easy on the lathe, and it always looks beautiful. 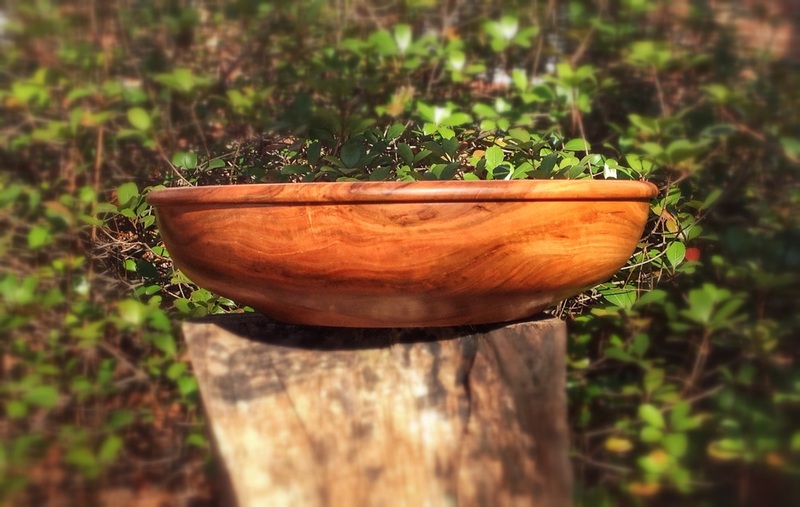 This bowl is no exception; at 13" wide and 3" deep there is plenty of real estate to show off the wonderful grain and color. The finish has a mild gloss to it to really show off the wood and the width at the base is about 7" so it sits quite sturdy. 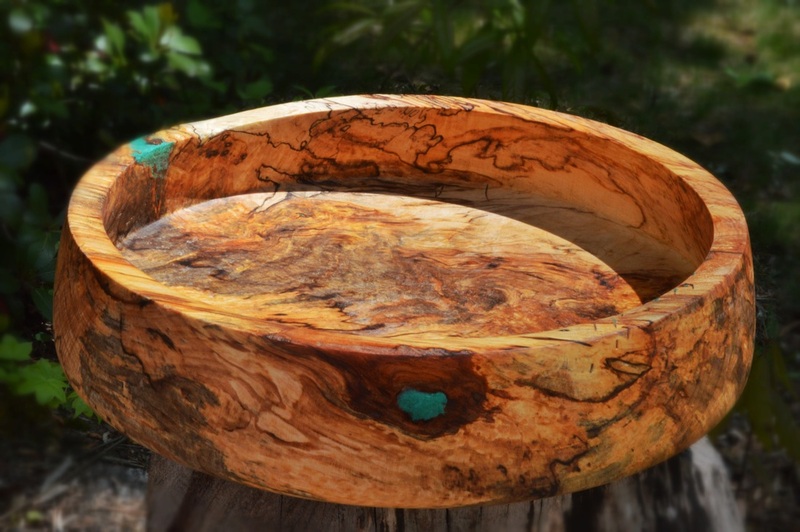 This bowl was turned from a beautiful burl and has a hole through the sides as a result of natural features of the wood. Stunning grain come through nicely with a more polished finish than I usually use. 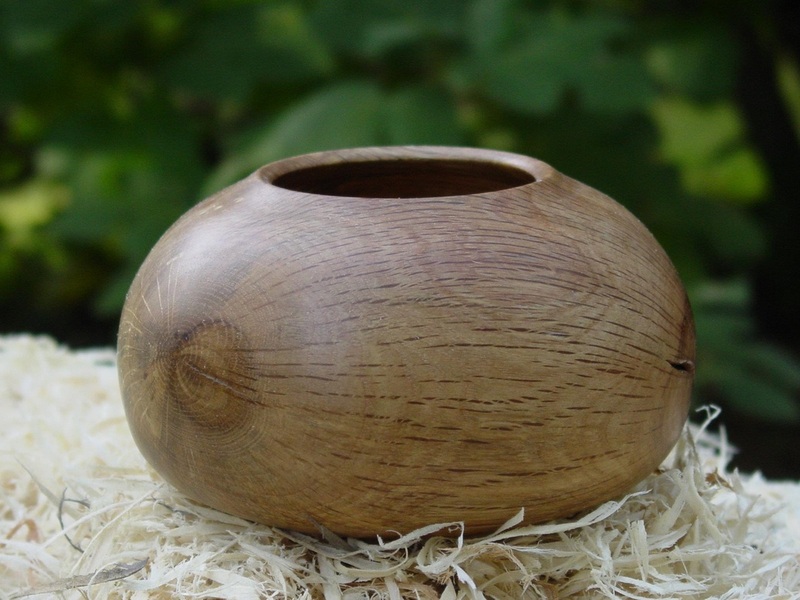 This bowl stands 4 1/2" high with a top and bottom diameter of 6 1/6" and 5 1/4" respectively and the diameter at its widest is 7 1/2". 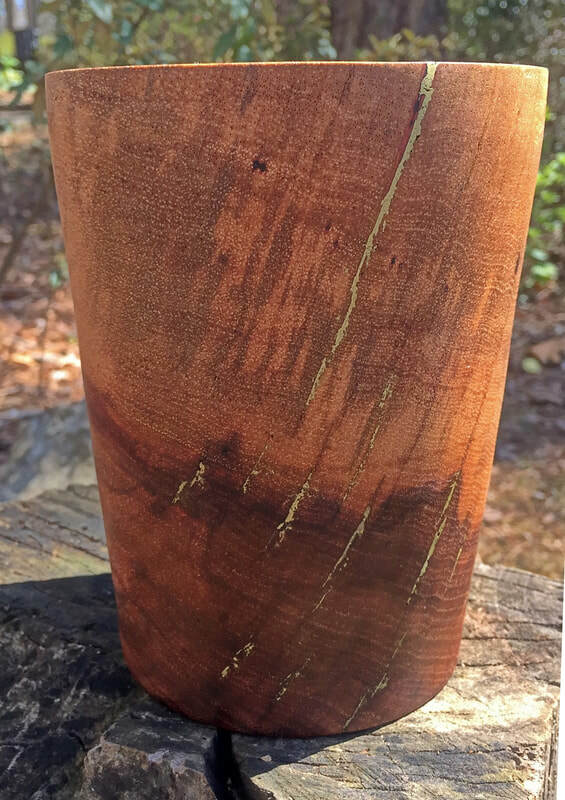 This 6" high vase was turned from a burl I acquired through, oh how shall I put this . . . let's say shady circumstances. I know, it followed me home, yes, that's it. Anyway, I am not sure of the type of wood but the grain pattern is simply beautiful. Although the base and top are both about 3 3/4 " wide, the sides taper in a bit just above the bottom, then bulge out a little ways up before tapering back in at the top. Imbedded in the spectacular grain are a few knots that go through the thin walls. This piece is bottom heavy and sits quite securely. The finish does have a gloss to it, but is not overwhelming. 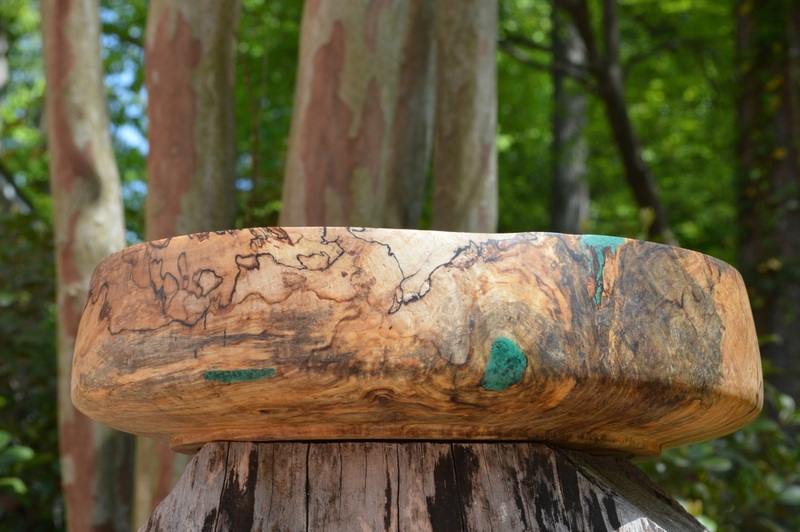 Also, the top became a little out-of-round as it dried, adding to it's character. This has become one of my favorite pieces and I considered not putting it up for sale, I still may change my mind. 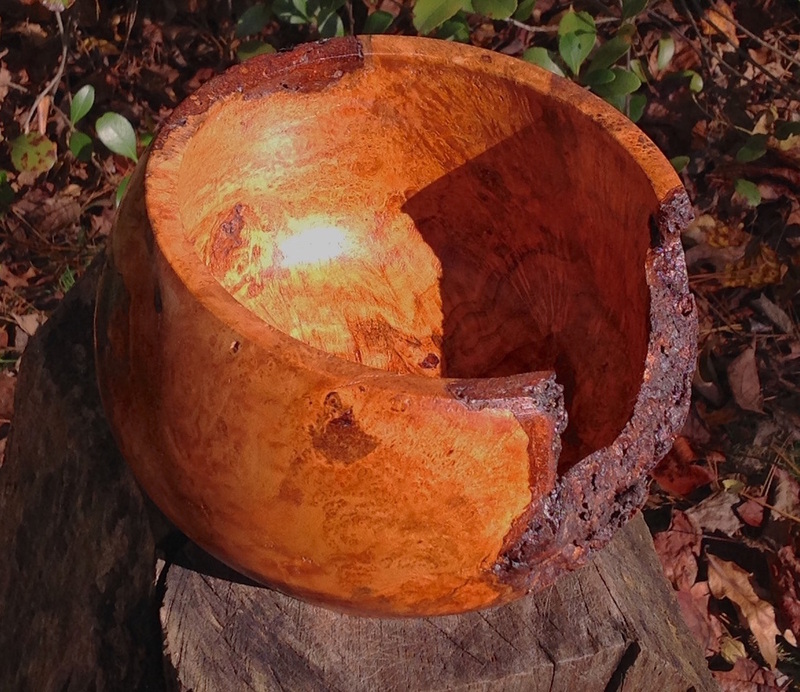 Burls are like gold to wood turners. 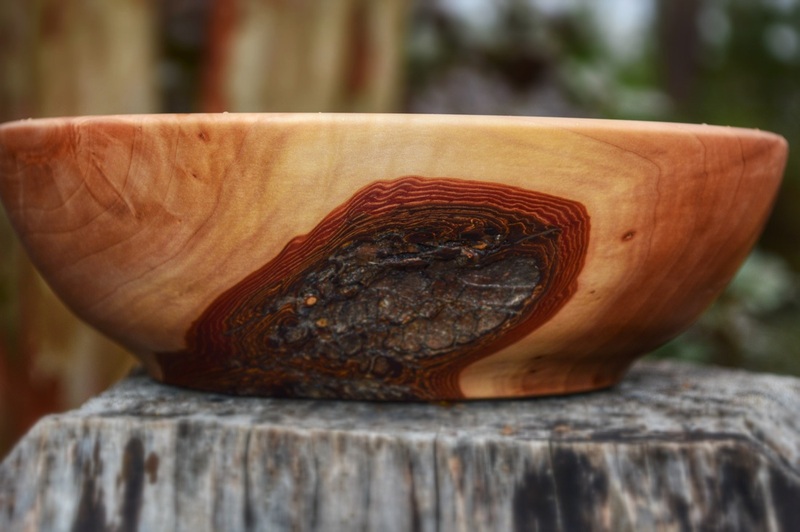 Cherry burls are even better. 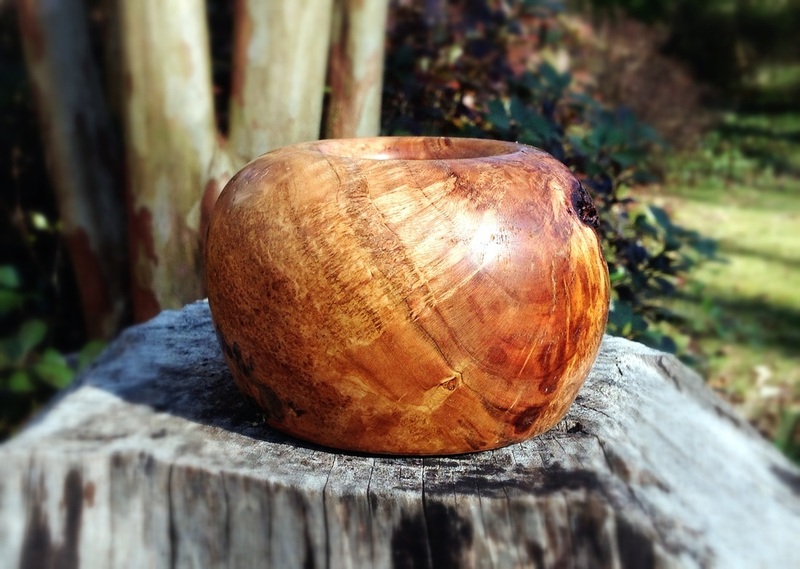 The grain in burls are, well, not really grain-like. They produce the most unique patterns, and cherry is such a beautiful wood. 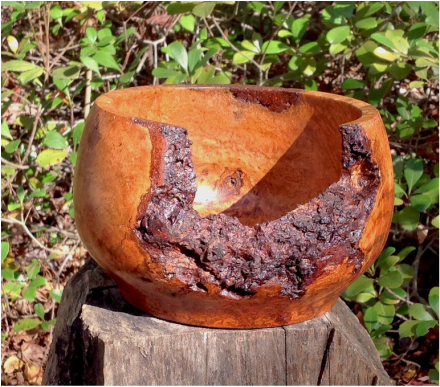 This piece stands about 2 3/4" high and 4 1/4" wide with the opening at the top 1 1/2". 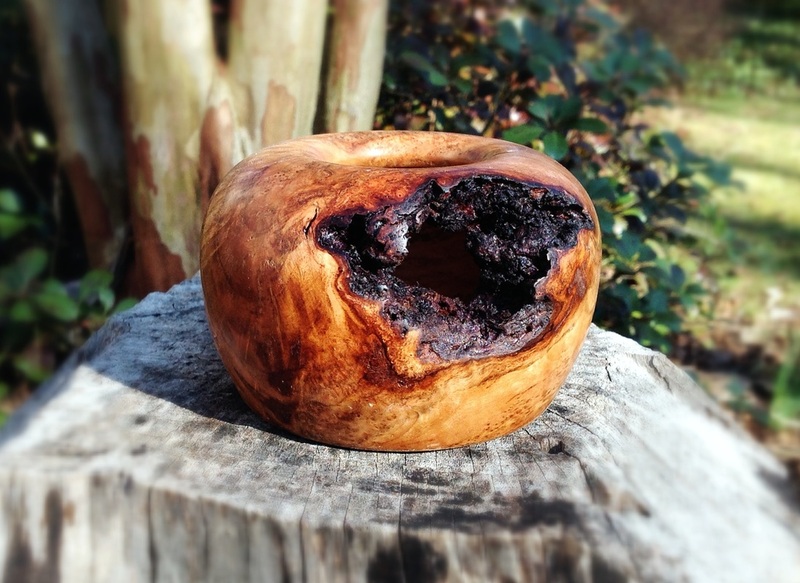 A void in the burl presents itself as a opening in the side; another fun feature of burls. 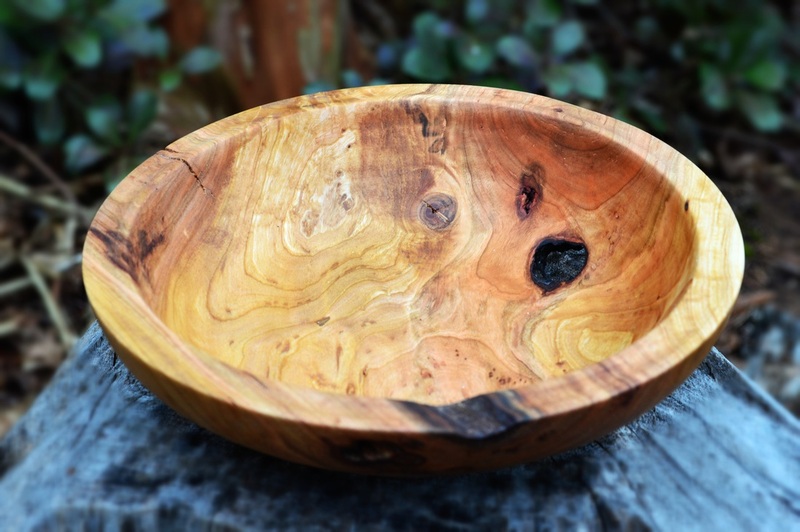 Beeswax and walnut oil produce a natural, satin finish. This has become one of my favorites. 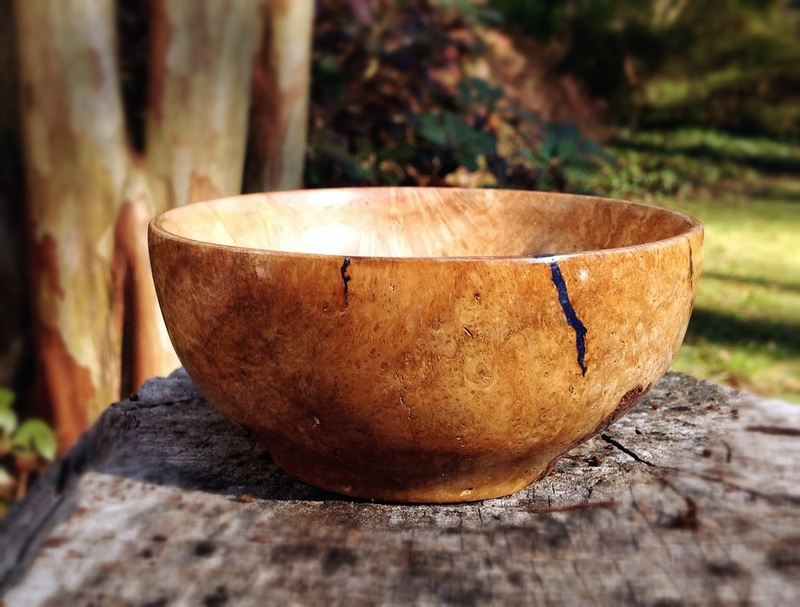 Light colored burl with beautiful grain pattern, I have filled some of the natural voids in the grain with Lapis Lazuli. The blue inlay shows off nicely against the wood. 4 1/2" diameter and just over 2" high. A glossy finish helps show off the blue inlay. This was one of those pieces that I really didn't know what was going to happen until it was finished. 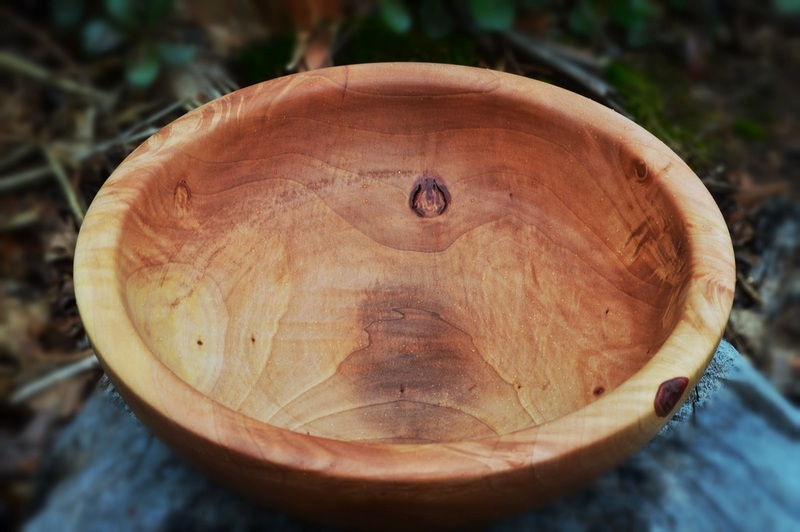 There was a sizable depression in one area and I wasn't really sure how to work around it without making the bowl quite small. 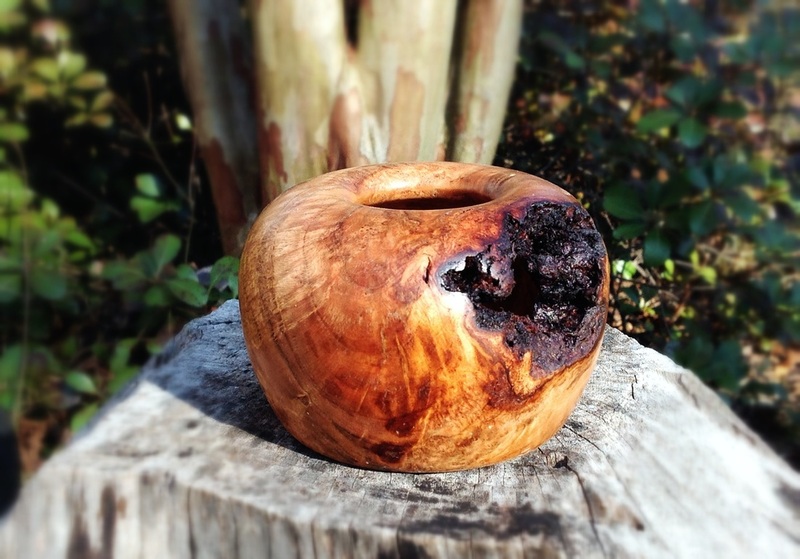 As I was finishing the shape the patch of bark started taking on an incredible appearance showing the layers from the outer bark to the solid wood. I was able to sand and finish the wood around the patch and am very pleased with the results. 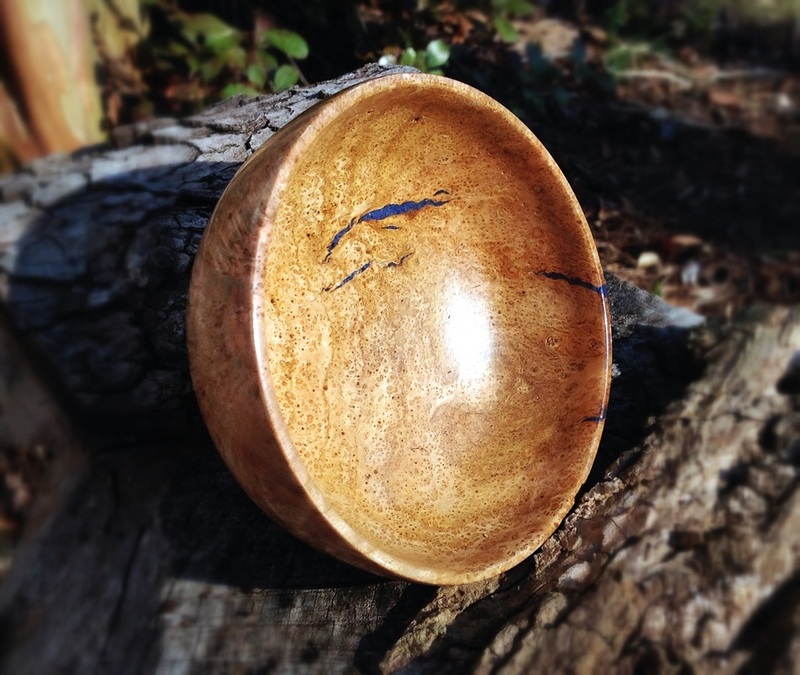 This piece is about 7 3/4" in diameter and sits about 2 1/2" high. 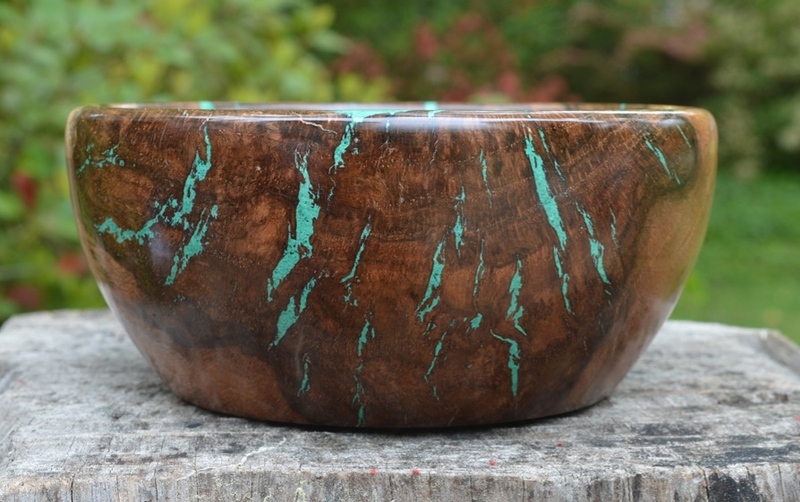 It is finished to a satin sheen using walnut oil and bees wax. 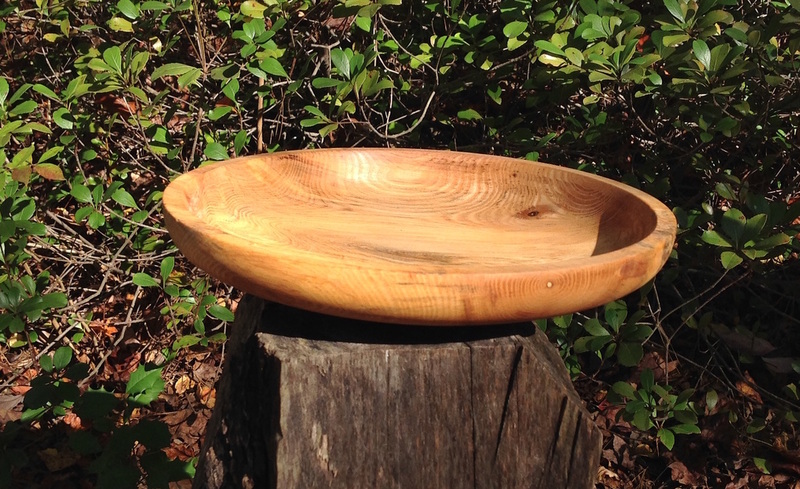 This large bowl is about 13" in diameter at it's widest and stands about 3 1/2" high. 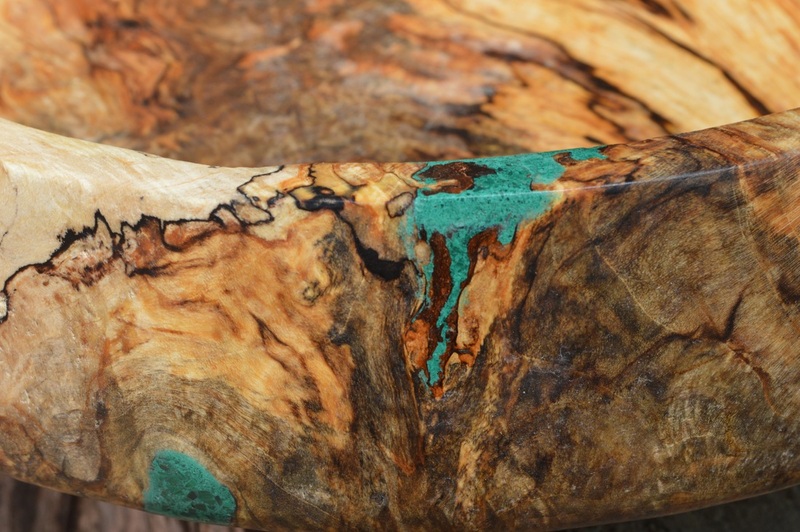 Stunning grain is all around, inside and out, with a few areas highlighted with Malachite. 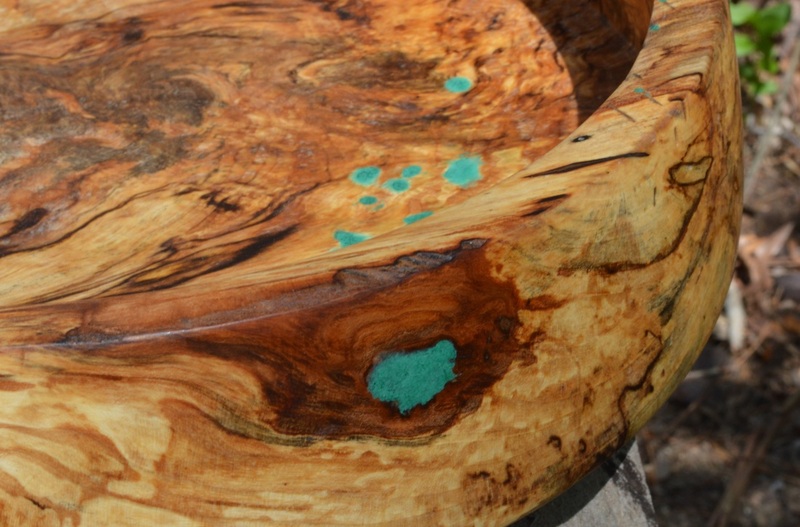 A few knots are the highlight of the beautiful grain of this Hickory bowl. The walnut oil and beeswax finish gives it a satin luster. 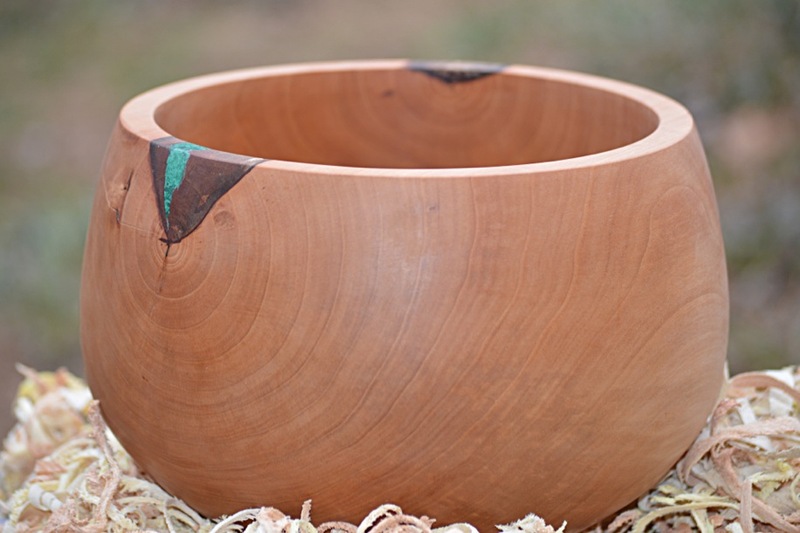 The bowl is 6" at it's widest, stands about 3 1/4" tall and the opening is just over 2 1/2" wide. 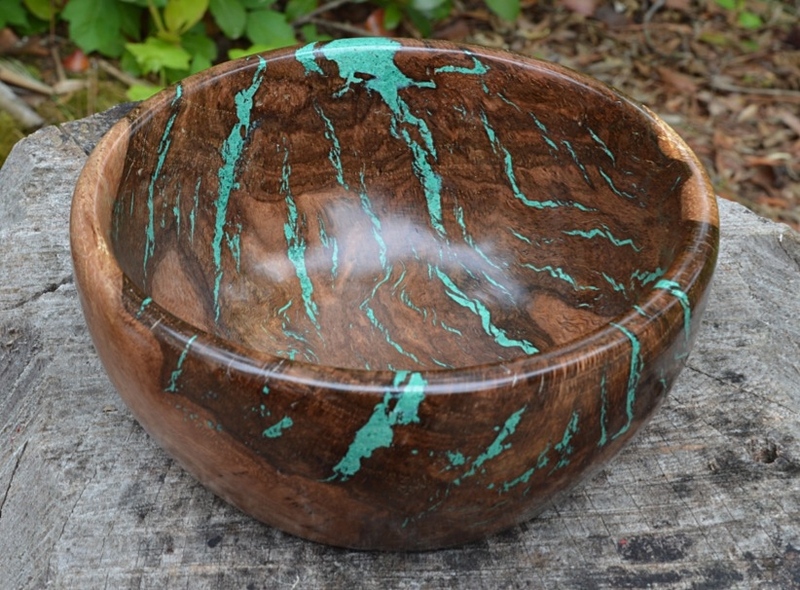 Two knots are on the rim of this bowl with a malachite inlay in one. I wish I could say this was an artistic venture, but the reality is that as I was finishing this, a piece fell out of the knot. 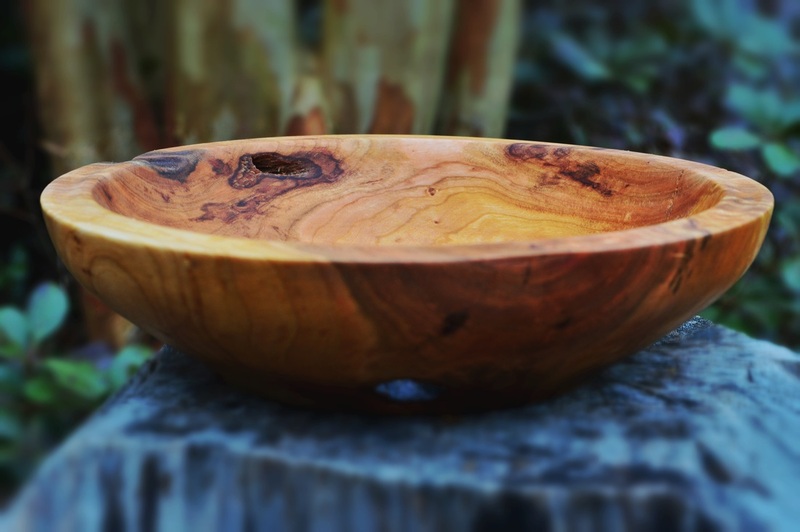 I loved the shape of the bowl and didn't want to cut it down any, so I added the inlay and am quite happy with the results. Interesting grain around an imperfection in the wood that caused part of the tree to be hollowed. This came from a friends pear tree they were removing. 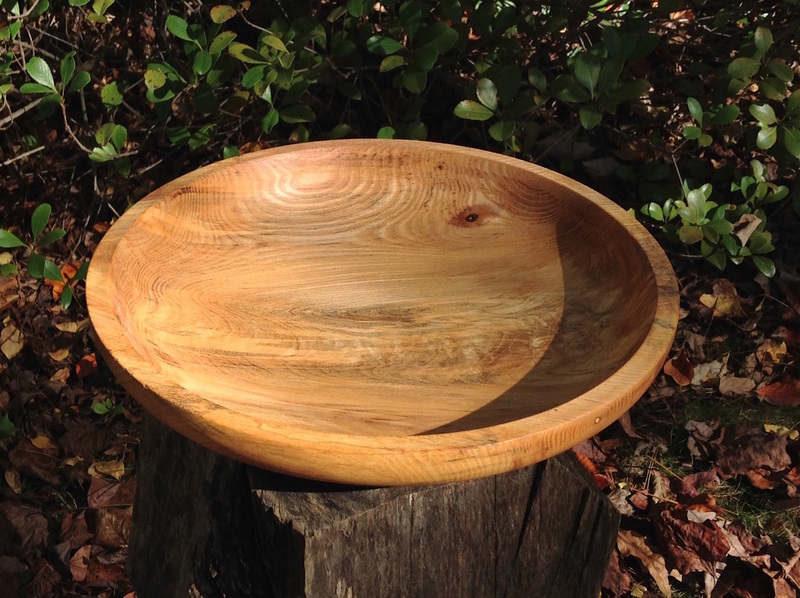 I made a few nice bowls from this wood, including a natural edged bowl that my friends got for letting me pick through their wood pile. 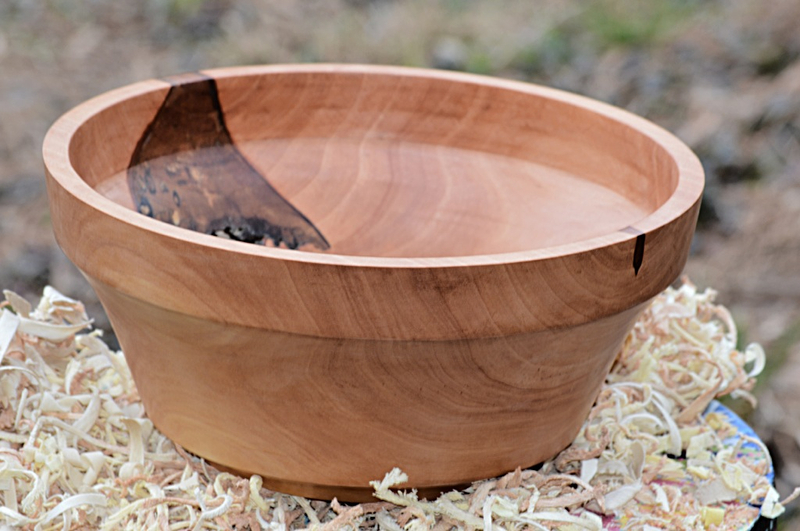 This bowl is 5 1/2" wide at the base, 10" wide at the top, standing 4 1/2" tall.